Now, how cool is this watch? Two watches in one! One one side you’ll have a casual and sporty chronometer on the other side it’s the more serene three hand watch. Limited to the lucky number of 888, this little marvel can be yours for $6195. Dual existence is the ultimate magical ingredient of fairytales and fantasy movies. Hamilton watches have appeared in a wide selection of movies on this theme, ranging from The Talented Mr Ripley to Spider-Man. The Swiss made American brand treads new watchmaking ground in 2013 by applying the concept of dual identity to its latest innovation, the Hamilton Jazzmaster Face 2 Face. Avant-garde and classical embrace each other in a watch with two distinct personalities, guaranteed never to come face to face, on or off screen. 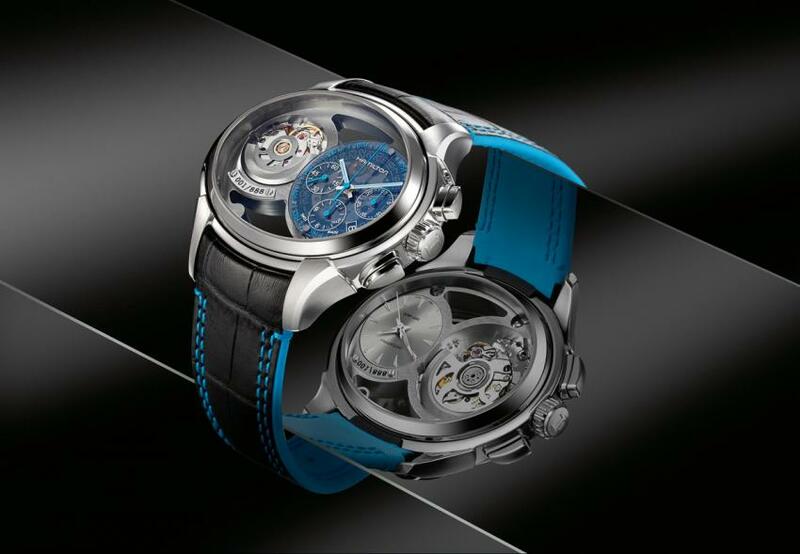 In the Hamilton Jazzmaster Face 2 Face there are two different sides to the design concept – and to the timepiece itself. 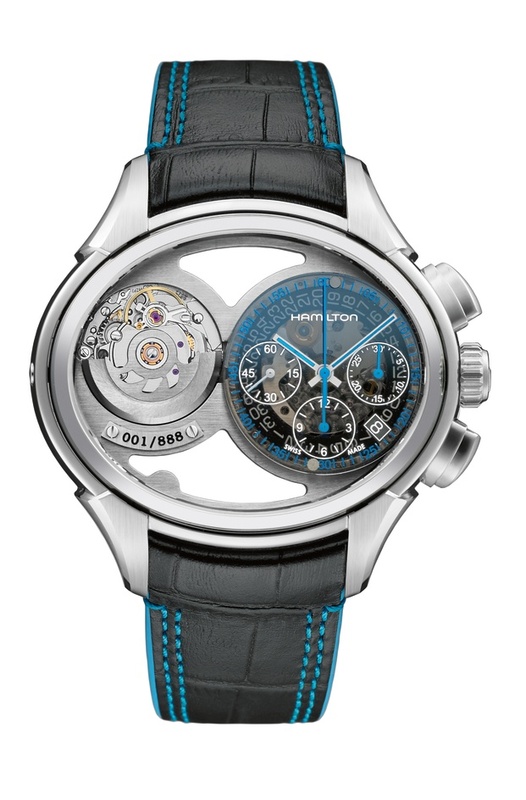 A unique rotating case houses two dials, one presenting a sophisticated “boy racer” chronograph, the other a calm, elegant three-hand timekeeper. The common denominator of the two contrasting faces are the decorated, skeletonized rotors of each automatic movement, fully visible in the oval-shaped case. Each individual watch incorporates two wearing options, both making diverse style statements. The two sides can accommodate different time zones, different frames of mind or different outfits – the wearer is always in the pilot’s seat. Refined craftsmanship, with expertise dating back to 1892, in close partnership with high-tech materials and functionality ensure that the theme of duplicity never compromises wearability or precision. Only 888 numbered pieces of the Jazzmaster Face 2 Face are being made. Propelling the current mirroring trend in haute-couture advertising into a totally new dimension, the Jazzmaster Face 2 Face goes beyond the concept of creating reflections to reach the realm of the optical illusion. The crystal on the chronograph dial has a smoky tint and edgy blue detail. In strong contrast, its three-hand counterpart integrates silver-colored enhancements that glisten elegantly from the sun brushed surface. All of the sapphire crystals have antireflective coating. Driving the chronograph is an ETA 2094 automatic movement, while the classical dial derives its energy from the ETA 2671. This watch dares to be different in grand style, with its slightly elongated, rotating oval case measuring 53mm by 44mm. 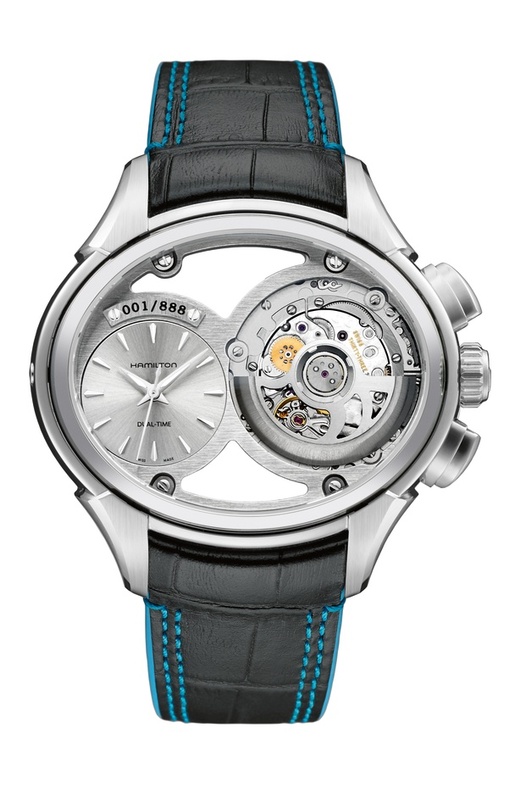 The black leather strap signs off the message of uniqueness with blue, soft-touch lining and double stitching, together with a new design of folding clasp to confirm its individualistic flair. Hamilton was founded in 1892 in Lancaster, Pennsylvania, USA. Hamilton watches combine the American spirit with the unrivalled precision of the latest Swiss movements and technologies. Known for its innovative design, Hamilton has a strong foothold in Hollywood, with products appearing in 400 films. The brand also boasts a strong aviation heritage. Hamilton is a member of the Swatch group, the largest watch manufacturer and distributor in the world with 160 production sites in Switzerland.